Ordered your Shelby GT500 without the factory Rally (Le Mans) Stripes? Trick it out with our easy-to-install Bumper, Hood, Roof, Rear Deck Lid & Rear Bumper Graphics kit. Graphic pieces are PRECUT and ready to install - NO TRIMMING required! This stripe package is not just a box of straight strips. Our kit consists of prefitted and contoured pieces as shown in the illustration. Kit is designed and manufactured to be set with 1.5" (38.10mm) spacing at time of installation. Premium cast automotive grade vinyl film used for this kit is available in a wide variety of popular colors. This kit is vehicle specific and WILL NOT fit all '05-'14 Ford Mustangs. 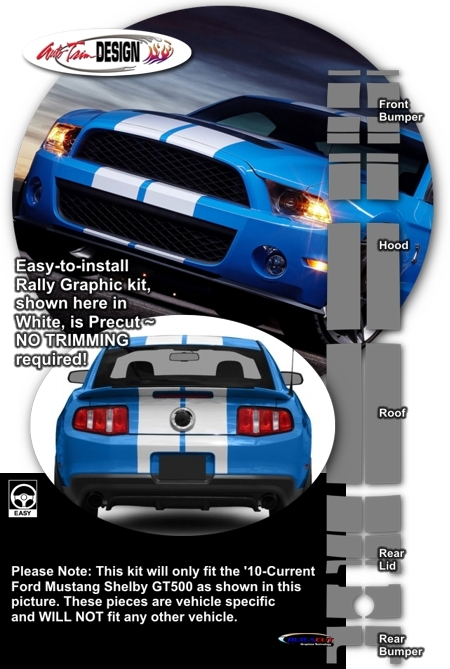 Kits offered in this description will only fit the '10-'14 Ford Mustang Shelby GT500. Removal and re-application of factory applied Rear Lid "SHELBY" lettered may be necessary prior to installation.